The financial market is a deep and complex jungle. Traders are rarely fully understand the forces that drive the markets (the buyers, the sellers and how the market is positioned). As the FX market (unlike other markets) is mostly traded OTC (Over-the-Counter), it makes the analysis of the market position a difficult task. Most trades are not cleared through an exchange (or a central clearing facility), meaning that we (traders and analysts) cannot analyze and understand how the market is positioned. Given that we have no actual way to understand who the sellers/buyers are (which is a critical piece of information, which I will elaborate later on), or how the order-book looks like (where the limit orders, stop-losses orders and the sizes of the orders), we face a difficult mission navigating through the scary jungle that is called FX market. 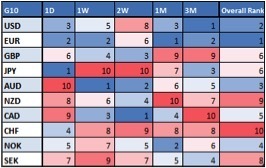 In addition to understanding the “market positioning” in the different currencies, one needs to look at the relative strength of a certain currency when looking to establish a successful strategy (rather than looking at a single-dimensional scope, which the currency strength against the USD). In this Quantitative research piece we will review methods to gather a lot of valuable information from sources that are widely available and that will help you in preparing your trading strategies, and take advantage of different analysis techniques to build long term strategies. We often look at currencies as pairs (i.e. EUR/USD, USD/JPY) because it’s easier to understand the concept better. A currency itself, so we were taught, has no value unless it’s compared to another currency. The perception that currencies come in pair is flawed, and prevents us from looking at the “big picture”. Most currencies are quoted linked to the USD, however this immediately cancels our ability to assess the USD strength relative to other currencies. To remedy this issue one should look at the FX world from an indexed POV. The notion of index is that once we compare currencies as indices (the same idea of equity indices) we can determine relative strength/weakness of a currency, we can rank the currencies according to their indices’ strength and analyze different time-frames. As we can see, EURCHF has strengthen about 3% since the beginning of December. 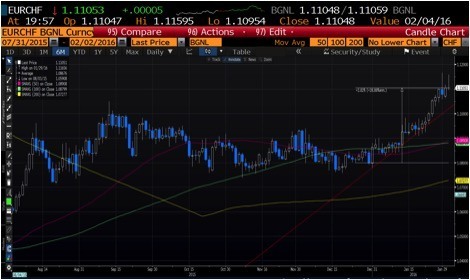 We might have not spotted this dynamic in case we were not following EURCHF on a frequent basis, however, using the currency indices we can identify strength (or weakness) of a currency. This analysis will help us detect attractive currency pairs to trade and take long dated view on their overall direction (trend). Bear in mind that as we use daily closing prices, this analysis will not work well for short dated trades. As we might understand by now, the FX market is very difficult to analyze in term of positioning. 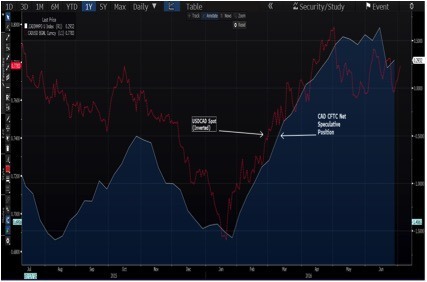 The major issue for that is the fact the vast majority of the FX market is traded OTC (over-the-counter), so the market participants are not obligated to disclose their trade, and trades are not cleared via a facility that reports these positions. Luckily, currency managers are still using FX exchange-traded instruments as part of their investments and trading strategies, and therefore we can analyze the published data by the US CFTC (Commodity Futures Trading Committee). A weekly report about the open interest in the market for a large list of assets (including commodities, equities, interest rates and FX) is published at the close of trading day on Friday, with a data that is relevant to the week ended on Tuesday (i.e., the data is published with a 3-day lag). What can we understand from these reports? As the reports are filtered by few types of investors: Commercials (Mostly banks and insurance companies), Non-Commercial (Asset Managers, Investment Managers), Non-Reportable (Hedge Funds, proprietary firms and small speculative traders), we can look at the spread between the Commercial type account and the Non-Commercial type accounts to see the “Net Speculative Position”, which, surprisingly enough, is highly correlated with the short-term price action of most currencies. As one can see, the correlation between the position index and the price action is relatively high, and it seems as if the underlying price action follows the positioning index closely. Obviously, the CFTC data (from the exchanges) reveals only fraction of the entire market, however, for the major currencies these will usually give an accurate gauge of the positioning for the different assets (especially for commodities, which are more exchange-traded instruments in their nature). 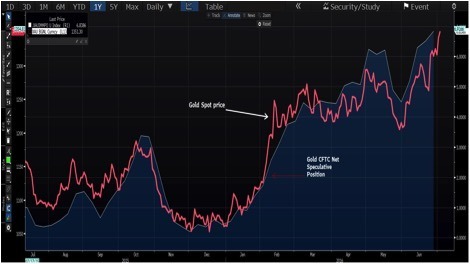 Looking at Gold price action vs. Positioning, shows the high degree of correlation, which mentioned above. To Summarize, A true understanding of the FX market, including the different forces that operate in this market, how they affect the price action, and how to take advantage of these effects, requires constant learning, data manipulation, and out-of-the-box way of thinking. The old “technical trading” will only take you further to some extent, but will lack in helping you develop a successful strategy. Only by taking the road less traveled, so to speak, traders will be able to get an edge. Quantitative approach to trading used to be the sole domain of sophisticated investors and hedge funds, but with few simple steps any trader can adapt these principals. 1. Introduction This risk disclosure and warning notice is provided to you (our Client and prospective Client) in compliance to the Provision of Investment Services, the Exercise of Investment Activities, the Operation of Regulated Markets and Other Related Matters Law 144(I)/2007, as subsequently amended from time to time (“the Law”), which is applicable in WGM Services Limited (“the Company”). All Clients and prospective Clients should read carefully the following risk disclosure and warnings contained in this document, before applying to the Company for a trading account and before they begin to trade with the Company. However, it is noted that this document cannot and does not disclose or explain all of the risks and other significant aspects involved in dealing in Binary Options. The notice was designed to explain in general terms the nature of the risks involved when dealing in Binary Options on a fair and non-misleading basis. 2. Risks 2.1. Trading in Binary Options is VERY SPECULATIVE AND HIGHLY RISKY and is not suitable for all members of the general public but only for those investors who: (a) understand and are willing to assume the economic, legal and other risks involved. (b) taking into account their personal financial circumstances, financial resources, life style and obligations are financially able to assume the loss of their entire investment. (c) have the knowledge to understand Binary Options trading and the underlying assets and markets. 2.2. The Company will not provide the Client with any advice relating to Binary Options, the underlying assets and markets or make investment recommendations of any kind. So, if the Client does not understand the risks involved he should seek advice and consultation from an independent financial advisor. If the Client still does not understand the risks involved in trading in Binary Options, he should not trade at all. 2.3. Binary Option are derivative financial instruments deriving their value from the prices of the underlying assets/markets in which they refer to (for example currency, equity indices, stocks, metals, indices futures, forwards etc.). Although the prices at which the Company trades are set by an algorithm developed by the Company, the prices are derived from the underlying assets /market. It is important therefore that the Client understands the risks associated with trading in the relevant underlying asset/ market because fluctuations in the price of the underlying asset/ market will affect the profitability of his trade.